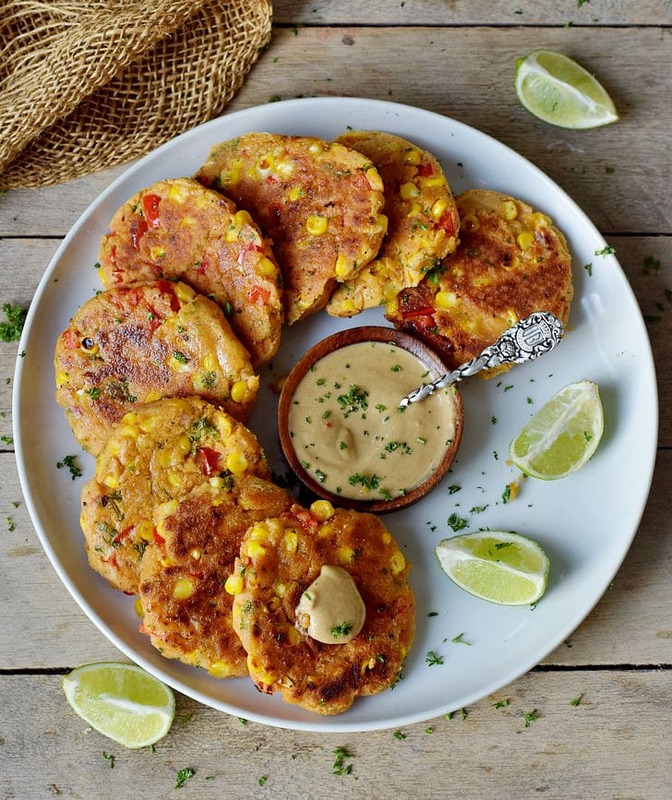 I love all kind of fritters because they are easy to make and perfect as a snack or side dish. 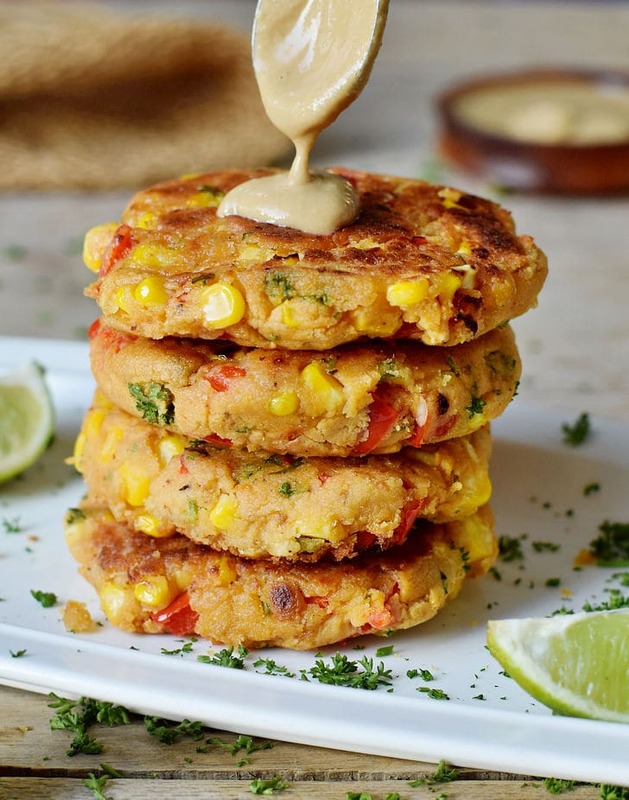 I already made these cauliflower fritters (patties) which are super yummy and healthy. This time I added corn and bell pepper to add some color as we all know that it’s important to eat colorful food. 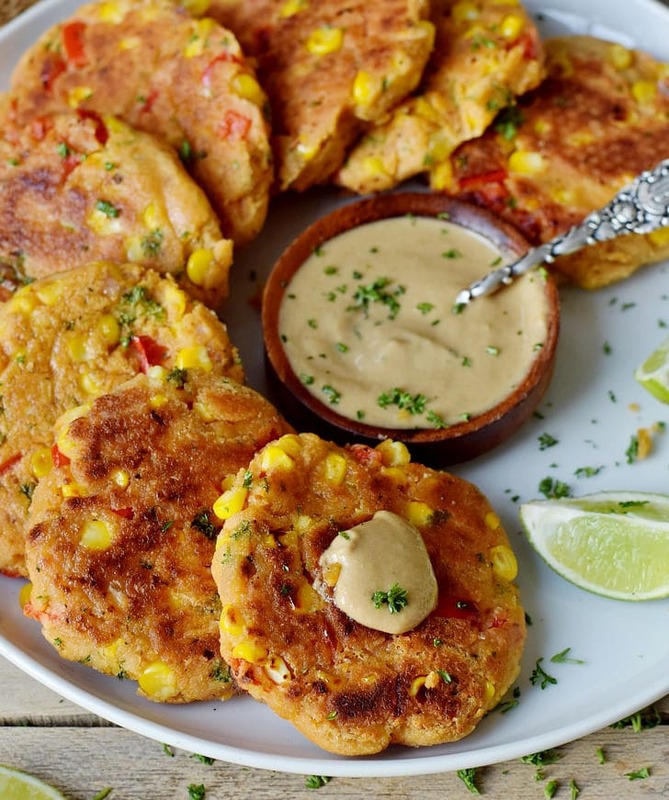 These veggie fritters are really quick an easy to make. They are furthermore gluten-free, vegan (egg-free), and protein-rich. You can serve them with a creamy cashew dip, mustard or even tomato ketchup! 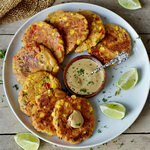 I’ve used cooked chickpeas to make these crispy veggie fritters. Not only do chickpeas add healthy plant-based protein, but they also hold the mixture together and because of this, you don’t have to use eggs! Awesome right?! You could use white cannellini beans instead of chickpeas or even kidney beans or black beans. The color will be obviously different when you use kidney beans or black beans, but the fritters will still taste delicious! You can easily prepare this dish in a food processor or blender. I used a food processor because it works the best for this recipe, in my opinion. If you don’t have a food processor, you could also mash the chickpeas with a fork. The process will take longer though. I used rice flour to make the recipe gluten-free. Feel free to use any other gluten-free flour, for example, buckwheat flour, chickpea flour, quinoa flour, sorghum flour or a flour blend. If you are gluten-free AND grain-free you should pick either buckwheat flour, chickpea flour or quinoa flour. I do not recommend using coconut flour because it’s very absorbent. If you aren’t gluten-free you can use all-purpose flour (wheat flour) or spelt flour. 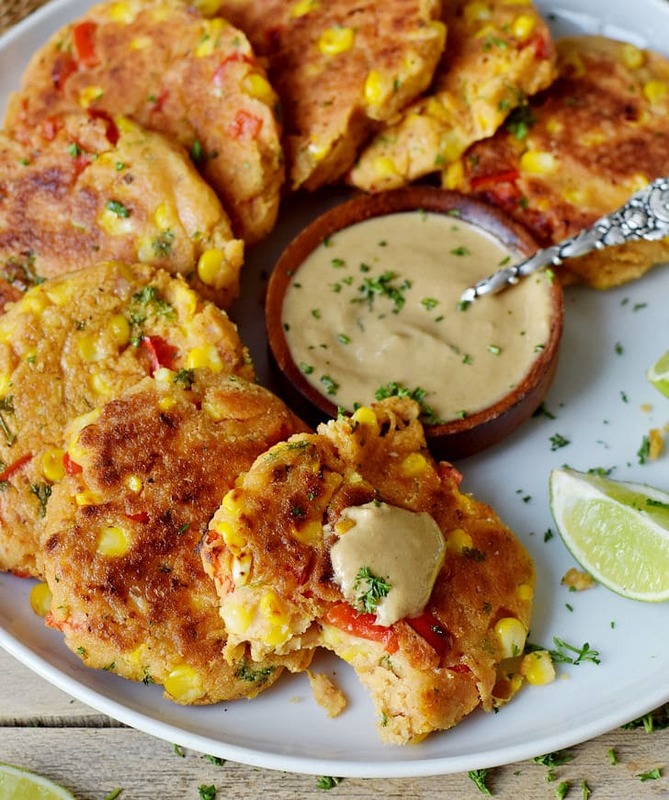 I chose corn and bell pepper to make these veggie fritters. However, you can use any other of your favorite veggies, for example, zucchini, broccoli, brussels sprouts, celery, green peas etc. You can also add mushrooms! So as you can see this vegan recipe doesn’t get boring since you can vary it as per your liking. As mentioned before, this healthy recipe is ridiculously easy to make in 5 easy steps. It actually takes less than 10 minutes to prepare the vegan patties. Then all you need to do is fry them in a skillet. You could also brush them with a little bit oil and bake them in the oven at 190 degrees C (375 degrees F) until crispy. It will take much longer though (probably 15-20 minutes from each side), however, you will need less oil. 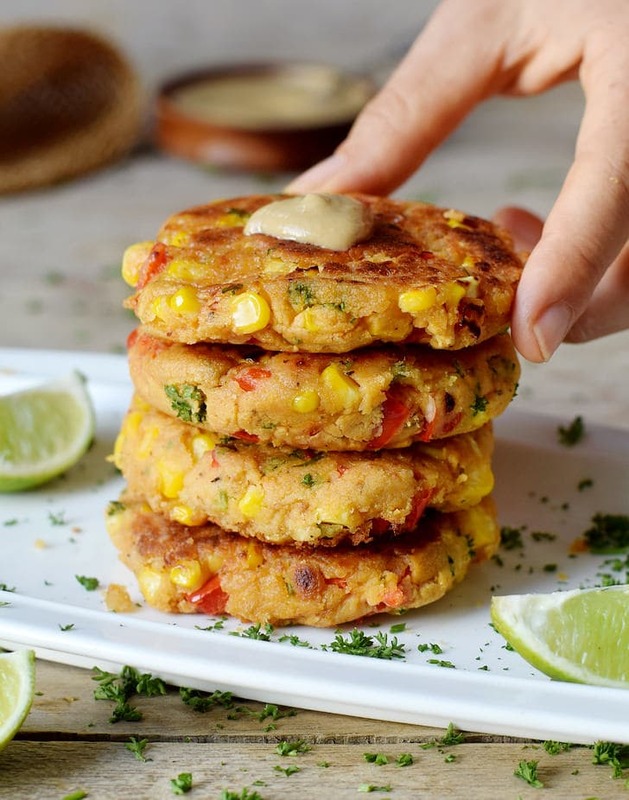 Should you recreate these vegan fritters, please leave a comment below and don’t forget to tag me in your Instagram or Facebook post with @elavegan and #elavegan because I love to see your recreations. 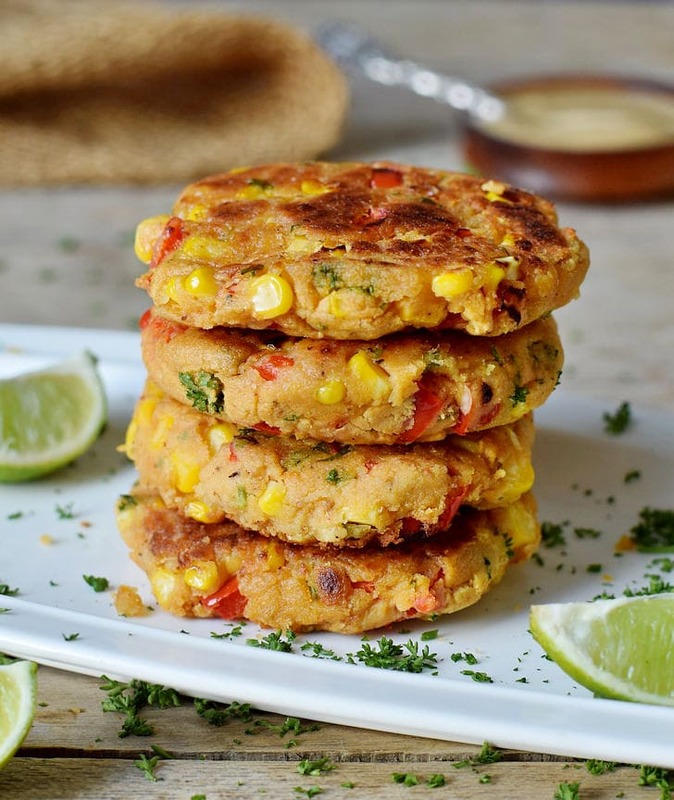 These veggie fritters with corn, chickpeas, and bell pepper are super easy to make, they are vegan, gluten-free, protein-rich and perfect as a snack, side dish, lunch or dinner. Process chickpeas, onion, garlic, lime juice, and all spices in a food processor. Add rice flour and mix again. Put the mixture into a bowl and add the chopped pepper, corn, and parsley. Stir with a spoon or use your hands. Form 8 patties and fry them with some oil in a skillet from both sides (about 5 minutes each) until golden brown. Please read the blog post to find out how you can make the patties in the oven. Serve with a cashew dip. Enjoy! I have't tried the recipe with any other flour, however, it should work with most flours. I mentioned some in the blog post above. 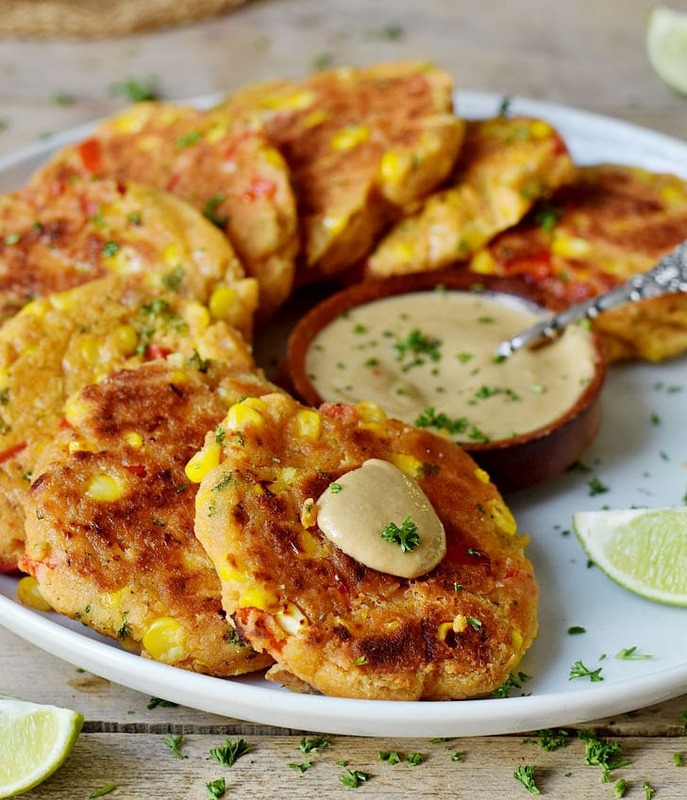 Love these veggie fritters Ela! They look delicious! And if you DON’T have those exact ingredients in the fridge you can substitute. Thanks for giving us the FORMULA rather than an exact recipe to use. Could I make them in oven instead of frying? These were so yum! As it was cooking my family kept saying how nice it smelt. This had amazing flavours! I used a grill (flat, open sandwich press) because the heat was better distributed to cook without oil. Although it did need 8-10 minutes each side cooking it this way. Worth it though. Has anyone used the air fryer for these???????? Hi there just wondering are the veggies still crunchy should I pre fry the veggies for fussy kids or do they cook in the patty? Hello this looks delicious ….what type of sauce did you use, I didn’t see a recipe for it. Looks delicious.would like to give them a try. Can I use boiled chickpeas here or I just need to soak them overnight only to use them for patties?